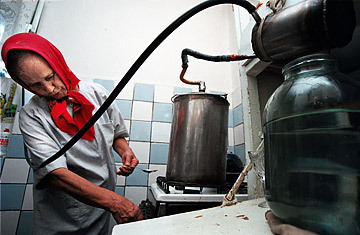 A woman makes samogon, a strong alcohol drink, in her home in Kazan, Russia. Every August, Nikolai Gusev juices hundreds of unwashed apples which grow at his dacha, west of Moscow. For a month he waits patiently for the juice to ferment and turn into a wine. He then distills the mixture, and stores the remaining liquid in a barrel for several months. The result is a highly potent drink (45% alcoholic), with an apple aftertaste which is the favorite tipple of his friends. "I had too many apples at my dacha and instead of throwing them away I wanted to do something with them, for me making moonshine is just a little bit of fun," Gusev says. Gusev is a completely different kind of moonshiner. He is one of Moscow's best-known guitar makers. His underground workshop is a short walk from Red Square and is filled with pieces of elegantly curved wood from disassembled instruments. The tiny bottle of moonshine sits on a shelf not far from his tools. Unlike the stereotypical moonshine (or samogon, as it's called in Russian), Gusev distills boutique and artisanal spirits, joining the country's homebrew renaissance. He doesn't need to do it. He is educated employed and has access to high-quality alcohol. "I don't do this to get drunk, for me it's a craft, it's an annual project," Gusev said. "The trick is not to wash the apples, there is natural yeast on their skin, which makes them ferment better." Russia is in the middle of a revival in moonshine not as a cheap way to drink, but as a hobby and craft. Actors and musicians have revealed their recipes to magazines. Indeed, Russian liquor store shelves and supermarkets now stock a product that uses the appeal of bootleg as its selling point. "I talked to my friends about my idea for sometime and we came to the conclusion that making samogon, would be a great business model," says Nikolai Poluetkov the manager of Kosogorov Samogon, which calls itself the first moonshine to have a license. "We spent 2003 looking for recipes. We found one that worked made from grape and in 2004 we launched our product." Kosogorov, which is bottled in a factory and tested by safety authorities, is sold in most supermarkets for $40. It is, however, made to look like the moonshine sold in Soviet times with it's label printed crookedly in a handwritten font. "It's a nice product with a good brand image," Poluetkov says. Samogon, which literally means self distilled, had its heyday in the mid 1980s when Mikhail Gorbachev enforced his alcohol reforms which, among other things, restricted sales to certain stories and prohibited restaurants from serving drinks before 2 p.m. It was a mini-Prohibition and, to get their lips on hooch, people were making alcohol with anything they had. One popular recipe suggested putting yeast, sugar and milk into a washing machine, switching it on a two hour cycle and then distilling the result. In rural Russia, peasants drank heart medication because they believed it contained alcohol. The artisanal samogon that are all the rage today (one magazine had recipes for samogon including everything from sultanas to rice to dill) emerged from that period. And while it has become fashionable to make samogon, it is still illegal to sell homebrew  though many people do it for a little bit of extra income. Good quality samogon, however, is unlikely to do anything for Russia's epidemic of alcoholism. Says Poluetkov, "If people want to drink window cleaner and aftershave, and sniff glue, nothing will stop them. Because window cleaner, aftershave and glue will always be on sale. An addiction is a psychological problem, not just a financial one." There are 2.5 million alcoholics in the country according to Russia's chief epidemiologist Gennadi Onishchenko. Just last year 19,000 people died of alcohol poisoning; and while this number is less than previous years, alcoholism is still a large factor in Russia's declining population and is responsible for the large gender gap in the mortality rates. To cut down on deaths from poisonous substances, the Russian Government plans to introduce a set minimum price for vodka, which will be 100 rubles ($3) for half a liter. "In Moscow this won't make a difference," explains Vadim Drobiz the director of the Federal and Regional Center of Alcohol Market Research. "Moscow is the only city where people can afford to regularly buy high quality alcohol. But in the regions this will be a big problem." He explains, "In rural Russia 100 rubles for a bottle of vodka is expensive, and they will drink something else, what I don't know." According to Drobiz 45% of the vodka on sale is contraband and retails below 50 rubles ($1.50) for half a liter. "I hope that for their sake villages will resort to making samogon, because at least people will know what they are drinking."